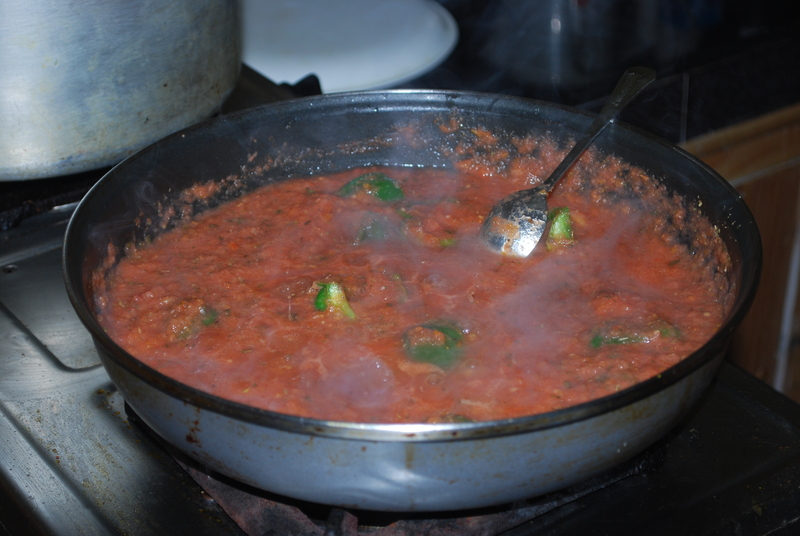 Firstly, puree the chopped tomatoes and a finely chopped onion till smooth and gooey. Then fire up the pan and drop in a large lump of butter till it bubbles beautifully, throw in the quartered green peppers. 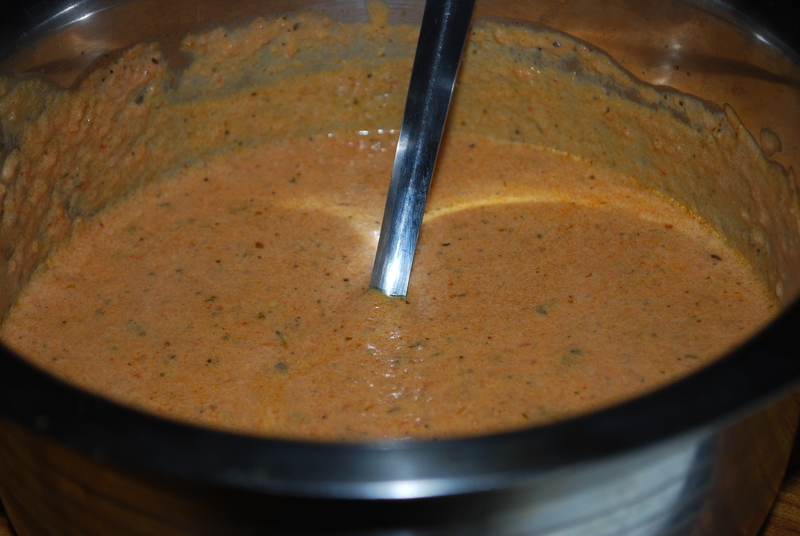 When the peppers are lightly browned pour in the whole puree mix (see the first picture for what it should look like). Allow the peppers to perspire all their lovely juices into the sauce, while this is going on plonk the spaghetti in boiling water with a tablespoon of oil. After a few minutes begin to add the spices and sauces making sure you stir constantly. First add the garlic and ginger paste followed swiftly by the soya sauce, fresh basil, parsley and oregano. Allow this to ‘stew’ for a few minutes then add the chicken stock cube, making sure that it’s completely dissolved. After all this add the rosemary and thyme (no sage I’m afraid Simon and Garfunkel) and taste to see if anything is needed and add accordingly. While this is cooking, in a separate pan pour in 200ml of fresh cream and one teaspoon of garam masala. After a few minutes add in all the tomato sauce and then all that is needed is some turmeric for colour (see second picture for colour comparison) and a pinch or two of salt and 100ml of milk. Allow to cook for 10mins on a low heat constantly stirring. Now all that is left to do is strain, serve and enjoy! It looks really yummy! The recipe sounds interesting and easy! I love a touch of garam masala and tumeric powder. Can’t wait to try it. i also tried experimenting with different ways of cooking spaghetti using simple ingredients i find in the nearby grocery, but this one seems interesting. i will definitely try this one of these days, although here in the philippines, a spicy spaghetti isn’t that as popular as it is in india. A spicy spaghetti is not all that popular…because I am an Indian…but yeah, people do eat it! It’s not very spicy though, just very well flavoured. You should definitely try it. Ok ignore that – I commented before the pics had time to load. Damn my 20 sec attention span! There are a few there, but next time I cook it I’ll post the photographs ok?